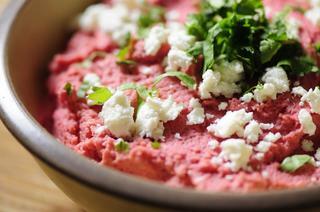 A creamy, delicious beetroot & chickpea hummus. Gluten-free, vegan, healthy, filling and so incredibly quick & easy to make! Sometimes you just need that little extra boost of nourishment that is both filling & delicious. This is one such creation. From the moment I whipped this up in the food processor, I had an immense amount of trouble not eating it all! It is just that good. And, apart from being ridiculously yummy, it is supremely healthy as well! Beets (or beetroots) are full of antioxidants, have amazing anti-inflammatory & detoxifying properties, and are an extra rich source of potassium, magnesium, folate & vitamin C (and they are chock full of fiber)! Combine that with protein rich garbanzo beans, and you have yourself one powerhouse of nutritious deliciousness! And you can't complain about its beauty either, eh? Just look at the light & fluffy yumminess! I promise you that once you whip this up, you'll have trouble not topping everything with it! It's great as a spread, a dip, a stuffing or even a pizza topping! I like to top mine off with a little cilantro and feta; but it is so darn good on its own, too! Feel free to experiment with your favorite way to use this amazing hummus (and please do share!) -- the possibilities are endless; and I'm certain you'll be amazed with the wholesome & tasty nourishment that you find. . . In a food processor or blender, combine all hummus ingredients.Blend until smooth.Optionally: Garnish with feta & cilantro.Enjoy!